Take a little more transit and eat a little less meat — two things you can do to reduce your environmental impact. In this installment of Meatless Mondays with Metro we head to the original Daikokuya to try their newest menu item: vegan ramen. Daikokuya is one of the most popular ramen spots in Los Angeles and rightfully so — their tonkotsu ramen is a delicious classic. The lines are often out the door and the fact that the Little Tokyo location is cash only does not seem to be a deterrent in any way. I haven’t had the opportunity to visit Daikokuya in years because while they do have a few vegetarian items on the menu, their ramen has always been made with a meat-based broth. And if you’re going to Daikokuya, you’re going for ramen, right? 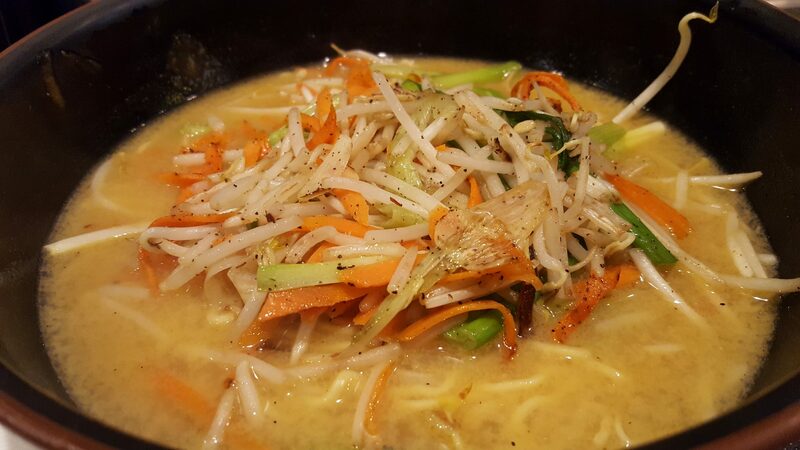 But now Daikokuya has not one, but TWO vegan ramen dishes on the menu. One is a spicy sesame, and the other is tomato. I opted for the spicy sesame because the tomato ramen was giving me watered-down spaghetti vibes. The broth’s spiciness comes from pepper. On first taste it’s not that spicy, but as you eat the heat builds up a little, so make sure to have some tissues handy because your nose will likely start running. The noodles are properly chewy, and the toppings help fill you up. The only topping that didn’t work for me was the grated carrot — the sweet flavor just didn’t quite mesh with the rest of the bowl. No issues with the bean sprouts and green onion though, so if I order it again I might try to ask for no carrots, extra bean sprouts. To get to the original Daikokuya, take the Gold Line to Little Tokyo/Arts District Station or Metro Bus 30 to Judge John Aiso/1st St.